A set of experiments conducted by a group of scientists of the London School of Hygiene and Tropical Medicine (LSHTM) demonstrated that 4gr of dried Moringa leaves powder were as efficient as commercial soap in reducing Escherichia coli from volunteers’ contaminated hands. 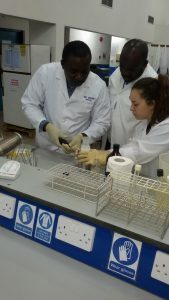 The purpose of our study was to investigate whether different preparations of Moringa oleifera, sourced locally in Ghana, function as an antimicrobial in a minimally processed form; whether the plant is bactericidal or bacteriostatic in aqueous solution, such as rinse water used for hand-washing and; if the plant is as effective as soap as handwashing product. This time, the idea was to conduct the experiments in real settings (Ghana) and use local varieties of the plant from local producers. The tests were also conducted at the National Public Health Reference Laboratory of Ghana (NHPRL). 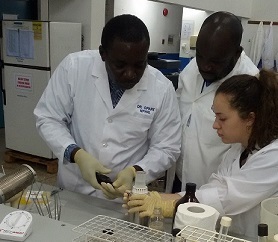 Jasmine Clark (LSHTM), David Opare (NPHRL) and Lawrence Henry Ofosu-Appiah preparing the samples for incubation of bacteria Escherichia coli at the National Public Health Reference Laboratory of Ghana. (Photographer: Enrique Raso/Action Against Hunger-Spain). In July 2017, the laboratory work started with a partnership team composed of: a coordinator from Action Against Hunger-Spain, two researchers from LSTHM and a team of from the NHPRL (a supervisor, a microbiologist and a laboratory technician). The tests were conducted following the same protocols and under the supervision of the same main researchers as the previous experiments. The only difference was the location and that the plant was sourced from a local farm in Ghana that follows permaculture techniques which implies organic growing conditions of the plant, in comparison with the plant used in previous experiments that was supplied by an European company. 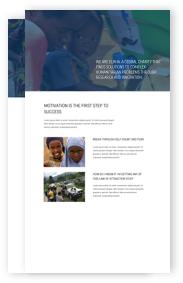 – Faecal indicators analysis of dilutions of different forms of the Moringa (to test bacterial composition of the plant once received from the farms). – Tests to determine if the plant was bactericidal or bacteriostatic against E.coli bacteria in aqueous solution, such as rinse water used for hand-washing. – A hand-washing trial to assess the efficacy of different forms of Moringa in removing E. coli from artificially contaminated hands compared to regular, non-medicated soap. We discovered that Moringa sources received in the laboratory were contaminated with faecal indicators. Still, we wanted to test if 4 gr of dried Moringa powder presented the same efficacy as soap as a hand-washing product. When the experiment was performed among 16 volunteers (following an adaptation of European Committee for Standardization protocol (EN 1499)), we found that the efficacy of Moringa was lower than that observed with soap. Although Moringa product reduced bacteria in pre-contaminated volunteers hands, the reduction was statistically, significantly lower than the one obtained by using soap. We also tested the stregnth of Moringa products to kill bacteria in water contaminated with a faecal indicator (E. coli). Bottles containing sterile distilled water were artificially contaminated with E. coli and varying amounts of different Moringa preparations (fresh leaves, boiled seeds, dry leaf powder) were added. The colony forming units (cfu/mL) of each bottle was measured each day during five days using membrane filtration to assess the efficacy of each different preparation in reducing cfu/mL compared to a control. We found that not only did Moringa forms not kill bacteria, but also that Moringa promoted the growth of bacteria in both sterile and rinse water solutions (from the water obtained from rinses of participants). This effect could be explained by the nutritious properties of the plant. These second results also indicate that more attention and caution should be given in other applications that have been given to Moringa products as a “disinfecting” water. The results showed that Moringa obtained from local sources cannot be used for hand-washing purposes without further treatment, as there is a high probability that the Moringa products are contaminated with other bacteria. The findings also showed that all three different preparations of the plant promote bacterial growth in aqueous solution and that when used as a hand-washing product it was less efficacious in reducing bacteria from volunteers hand that had been pre-contaminated than soap. If Moringa accelerates or otherwise aids the growth and proliferation of bacteria that have a low infectious dose, as is the case with many gastrointestinal pathogens, its use around sinks, this being an important site of infection, or in humanitarian settings could increase the risk of infection. As a conclusion, this study suggest that in its unprocessed or minimally processed form M. oleifera is not an effective antimicrobial against faecal indicator bacteria in aqueous and rinse water solution and its use as a hand-washing product should not be advocated due to the plant’s promotion of bacterial growth; this being of particular concern in resource-limited settings.